Last edited by mymuro on Mar 1st, 2019 6:32 pm, edited 1 time in total. Thanks OP. Forwarded the info to friends that have Xbox's. Yes!!!! I'm really excited by the adventure time game. Been a huge fan for years. my kids just started watching adventure time, they're going to be excited about this! This month was the month to put salt on Sony's wound but I guess MS passed on it. I'm excited for next month's PS+ lineup, mw remastered and the witness!! Last edited by Mars2012 on Feb 27th, 2019 3:31 pm, edited 1 time in total. Excited to play Star Wars Commando. Almost bought it several times. MW remastered is interesting although I think the Witness was an April 2018? game with gold. Pretty good month. A little something for everyone. 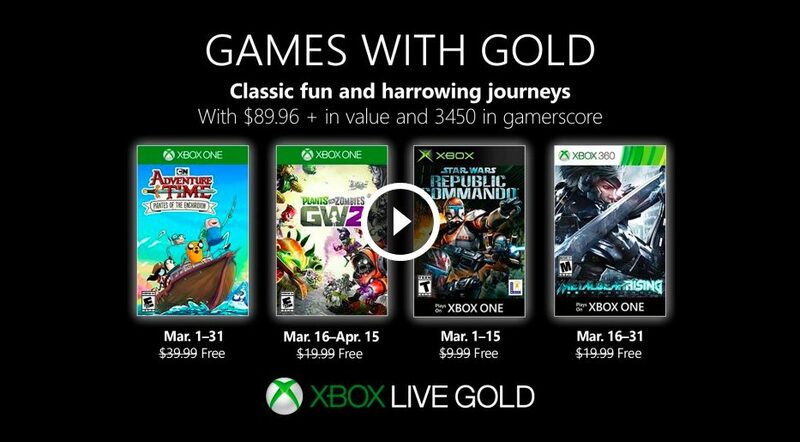 I'm glad that they are including OG Xbox games in GWG which is nice. Terrible games, but I've got enough to play with Apex, Crackdown 3 (mindless fun), and Civ 6 on PC... so no biggy. Although it has aged, Republic Commando is actually a fantastic game and I'd highly recommend it. This game did so much right, it's sad it never got some kind of sequel. I have a friend who has clocked close to 200 hours on PvZ because the online is that fun. Although, who knows how alive the cmunity is now. MGS: R is also supposed to be too notch but I've never played it.